Heroes, Heroines, and History: Who was Lady Godiva plus GIVEAWAY! Who was Lady Godiva plus GIVEAWAY! Ever ask yourself who was Lady Godiva, the woman on the box of chocolate? Interesting enough, neither have I. But I ran across her in some research and thought you might enjoy knowing who this naked woman was. Let me start by saying Lady Godiva (some sources refer to her as Godgifu) was a real person who lived in the 11th century. She was a noblewoman of Anglo-Saxon descent, married to the powerful Earl of Mercia, and Lord of Coventry, Leofric. Lady Godiva was known to be a very generous person and also a landed lady who gave freely to the church. Husband and wife built the Benedictine monastery in Coventry in the same spot the Danes had destroyed a nunnery in 1016. Lady Godiva is said to have been the driving force behind this monastery. Leofric and Lady Godiva are credited as being benefactors to at least five other monasteries. 19th century statue of the legendary ride, by John Thomas. Lady Godiva was one of the founders and earliest rulers of Coventry. The Benedictine monastery they founded overlooked the River Sowe and the town of Coventry grew up around it. She gave Coventry several fine metal works as well as bequeathed a necklace valued at 100 marks. Another necklace was given to Evesham, to be hung around the Virgin Mary's neck, along with a life size crucifix (rood) made from Gold and Silver. Another generous contribution was to to St. Paul's Cathedral in London, where they donated a gold fringed chasuble (outer most robe worn by the priests). With the Norman conquest, many of those gifts were eventually carried off to Normandy or melted down for bullion. 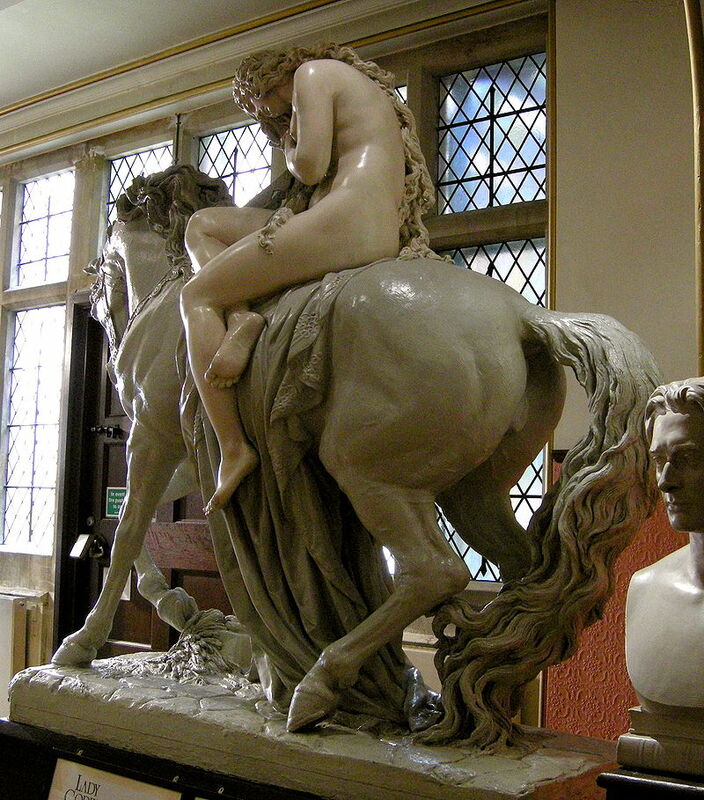 Now, with the history lesson behind us... What ever prompted Lady Godiva to ride her horse naked through Coventry? The truth is this is most likely a myth. The first mention of a naked Lady Godiva was nearly two centuries later and told by Roger of Wendover who was known for his exaggerations. 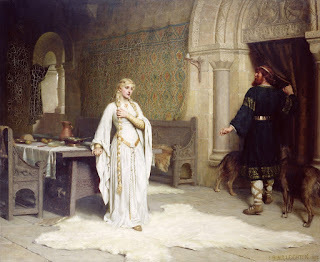 Lady Godiva:Edmund Blair Leighton--One of my favorite painters! So what was the story he told? The story goes like this... Leofric had placed heavy taxes on the citizens of Coventry giving them a crippling burden. Lady Godiva couldn't bare to watch the people suffer and continually asked her husband to lower the burden on the people of Coventry. He refused over and over. Tiring of her repeated pleading, he threw out a challenge, knowing she would never follow through--he'd lower the taxes if she rode naked on a horse's back through the center of town. Lady Godiva, being the kind and generous person she was took her husband up on his bluff. She first sent word to all the people of Coventry to go into their houses, close their windows and not look. She removed all her clothing and climbed atop her horse, using only her hair to cover herself. She then rode through the town. As she passed Tom's tailor shop, he peeked out the window to watch her ride by and was struck by blindness. When she returned to her home she confronted her husband and demanded he uphold his end of the bargain. Leofric did stand behind his words and lowered the tax burden on the people of Coventry. Leofric may not be remembered today but Tom on the other hand will be. He is forever known as peeping Tom. There is a statue of peeping Tom at Cathedral Lanes Shopping Center. Thanks to Wiki for all Lady Godiva pictures. I really enjoyed this post. So often Lady Godiva gets a bad reputation. Thanks for coming by, Kate. I agree, she does get a bad rap! That was VERY interesting! Thanks! Thanks for coming by, Connie! :o) I didn't know all those facts either, Caitlin. They were fun to read. Awesome story! Thank you! I'm just stopping by, no need to enter me (I have both books). I had not heard this story or how peeping Tom got his name. I didn't realize that was how Peeping Tom got his name either. That's an interesting tale about Lady Godiva. Thanks for coming by, Jan. So much fun and interesting facts in history. Hey Stella! Glad to hear you'd like to read SOF! Good luck in the giveaway. Awesome story and information1 No, I never thought much about Lady Godiva, but how I know the story. The part about Peeping Tom is great. Hey Kay, it is funny how things come about. This most likely being a myth maybe the term was created by the myth teller. Who knows! I didn't really know that Lady Godiva actually exists. How fascinating! Yes, I am sure she would be rolling over in her grave should she know what story had been foisted upon her name postmortem. Now I know the story of Lady Godiva and Peeping Tom but what has that to do with Godiva Chocolates? LOL! Well, I guess that is another post! I don't know what the 2 have in common. I will have to look into that! Why would someone name a chocolate after her? Fascinating story! Thank you for the giveaway too! Hey Beth, I love to read little tidbits like this. They are fun and interesting. Glad to do the giveaway. Good luck! This is on my must read list! Sounds like an awesome read! Thanks for the giveaway chance! Yay!!! So glad it is on your TBR list, Wenona! Thanks for coming by and good luck! So that's where the Peeping Tom comes from. Very interesting! And poor Lady Godiva having to go naked to help the people. I Tweeted link & shared on FB. 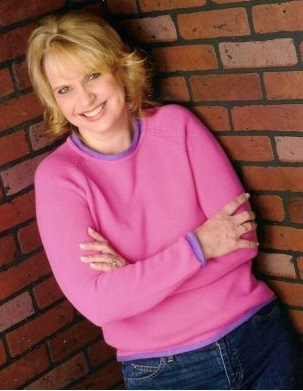 Thank you for helping me get the word out, Brenda! Well, from what i can tell it is probably a myth told by a man who had a very vivid imagination! But poor Lady Godiva is right. Who would want that tied with their name. I love history and add a little chocolate to it just makes it sweeter. I never knew the story behind Lady Godiva, but I sure do enjoy the chocolate. I would love to have a copy of one of your books. Thanks Kim. I love chocolate, too. Too much as a matter of fact! And Godiva chocolate is good! Good luck in the giveaway! 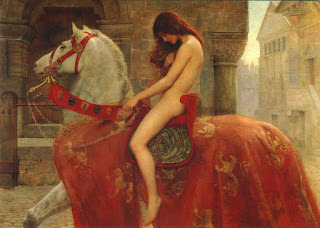 What a great post about Lady Godiva. what a great story. Thank you for a chance to win great books. mommystuck1(at)optonline(dot)net. Hello Tammy. I love history and learning even the myths of history. It's all fun to know and understand where these stories originate form. Good luck in the giveaway and thanks for coming by! Thank you, Lisa. I hope you get a chance to read some of my books. Thanks for coming by and good luck. I learned about Lady Godiva in a World History class in the ninth grade back in 1949. I always thought her to be brave and courageous to do something like that in her day. Whenever I hear the term "Peeping Tom" I think of this story, and I think of her whenever I see or eat Godiva chocolates. Thanks for bringing it back to mind. I've heard of Lady Godiva, but didn't know for sure that she was a real person. And very interesting about 'peeping Tom'! Hello Patty. I guess we will never know for sure if she did what was said she did. But it does sound much like a myth, I have to say. Makes me want to be able to go back in time to find out for myself! Thanks for coming by! I had not heard the story behind Lady Godiva or Peeping Tom...very interesting! Shattered Memories sounds so intriguing and is definitely on my TBR book list! I can’t wait to read it!! I would love to win a copy of it. Thanks for the opportunity of this giveaway!!! Hi Joan. I never had either. It's funny when you hear where some of our sayings come from. They all seem to have an origin and finding out just what that is always interesting. Hey Linda!! Good to see you here. thanks so much for sharing about this post. Good luck in ghe drawing. How interesting! History holds lots of unique stories, whether entirely true or supposed to be. Thanks for such an interesting post! That's how I feel Rebecca!! So interesting to find out the truths and even the myths. Sometimes its just as interesting finding out how the myths came to be. Thanks for coming by. Hey Dana! Thanks for coming by. You are in good company for people who love history here at HHHistory! Thanks for this VERY interesting post. I wasn't aware of all of the facts concerning Lady Godiva and I certainly didn't know about Peeping Tom's origin. Hey Connie, I love learning about new things in history and love to share it. Thanks for coming by. Thank you for coming by, Kathy. Good luck in the giveaway. I hope you get a chance to read my books. I honestly never thought about Lady Godiva before. This was a great post, thanks for sharing...I love the Peeping Tom part. You learn something new every day. Enter me in the drawing please. If I win, I will give the book away on my blog. I am halfway through Shattered Memories...so good! It's taken me awhile to be able to pick it up and read it, but it's been worth the wait. Hello Chappy! 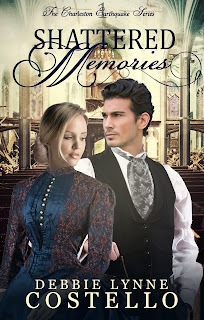 I'm so glad you are enjoying Shattered Memories! I'd love to do a giveaway on your blog! Very interesting article about Lady Godiva. 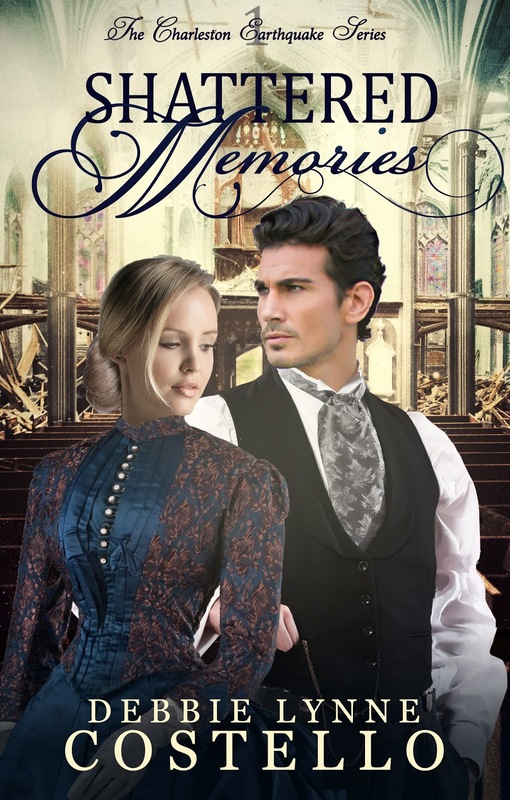 I'm looking forward to reading "Shattered Memories". Anything that takes place in Charleston SC makes for a great book. Not many books are about the great Charleston earthquake. Hey Dianne. No there really aren't too many book out there on the earthquake. And I don't know of any romance. Good luck in the drawing and thank you for coming by.